First Line:The air terminal at Inuvik has comfortable chairs and some nice Arctic art on the walls and usually a lot more empty space than passengers, so it is not exactly O'Hare, but it's not Tuktoyaktuk either. Inspector Matthew "Matteesie" Kitologitak of the Royal Canadian Mounted Police is one of the few Inuit officers to make it past the "token" level. For quite some time, he's been on loan to the deputy minister of Northern Affairs in the Canadian government, so it comes as a bit of a surprise when his old RCMP superior manages to get him back so Matteesie can investigate the disappearance of a small plane suspected of carrying members of a drug ring. Matteesie hasn't even had a chance to investigate when he witnesses the murder of a very powerful local man. While going through the cast of characters, he spots a connection between the two cases, and it boils down to locating the suspects and gathering the evidence. For me, the first person narrative didn't quite work in this book. Although Matteesie was an excellent guide through the Arctic landscape and very good at describing the other characters, he kept me at a distance, and I never really felt as though I got to know him. The mysteries of the missing plane and the murdered man weren't particularly suspenseful, but their solutions kept me guessing until almost the end. The star of this book is the Arctic landscape and how to survive out in it. Matteesie traveled by snowmobile, dog sled and bush plane through a frigid and alien landscape. While he traveled, I learned why old-timers prefer dog sleds to snowmobiles (if the snowmobile breaks down and you're stuck and starving, you can't skin and eat a snowmobile), just what survival gear is mandatory for any sort of travel, and that it's wise to leave your vehicle running in the Arctic cold. If you switch off the ignition, the vehicle may never start again. That's just the tip of the iceberg for all the things I learned. 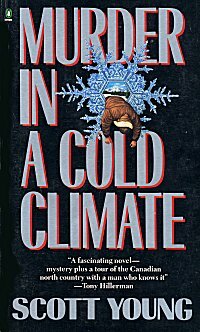 In reading Murder in a Cold Climate, the author's love of the landscape came through loud and clear, but the story and the characters were not as strong as the setting. Ugh, I didn't need to read that about why old timers prefer dog sleds this early in the morning. I think I'll skip this book. Kathy-- That's the only real ugh moment in the entire book!